ACS is Australia Computer Society and is required for certain job occupation in Australia’s SkillSelect permanent residency application. ACS assessment will analyze your educational to match your degrees with Australia’s educational system and provide a certificate to claim ICT major or Minor status. 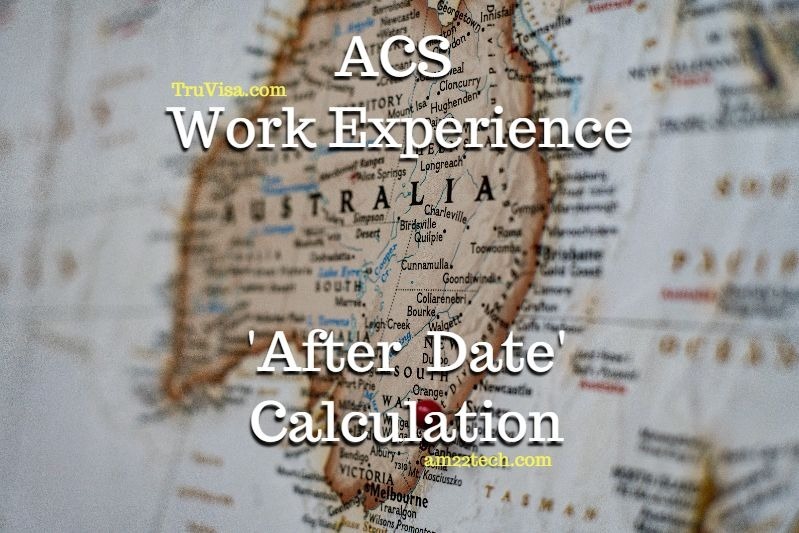 The same ACS application can be used to evaluate your work experience as well. This status helps gets points on Australia PR application. The most important date is ‘AFTER month‘ that’s mentioned in the second line of the ACS report. Since, they have only specified the month and not specific date, the biggest confusion is over what date to use in Australia SkillSelect EOI (Expression of Interest). The official ACS guidance is that you can use the start DAY in EOI as the day of the date you filed your ACS application. Example, in the sample ACS report, AFTER April 2010 is the start month for relevant work experience and this application was filed on 3 April 2018. You can use the start DATE while filing EOI as 3rd April 2010. Lot of forums and people might ask you to use the next month’s first day as start date due to the word ‘AFTER April 2010′. But, this is NOT true. Not sure why ACS does not clearly write the full date in their letter to avoid any confusions. That’s how it is and we can’t change it. ACS deducts 4 years from your TOTAL work experience. In sample report above, person has 11 years 6 months relevant work experience starting from June 2006. If 2 years from last 10 years are deducted (Go back 10 years from 3 April 2018, you get 3 April 2008), then add 2 years as a deduction to reach at 3 April 2010 – Called as Skill Applicability date. If 4 years from total experience are deducted, this date would come out as JUNE 2010. How? Count the relevant years from ACS report starting June 2006, you reach June 2010. 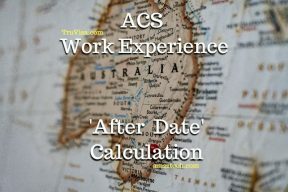 The second option results in an earlier ‘AFTER DATE’ for your work experience, and hence ACS will award you April 2010 date. Per above rule of deducting 4 years from total experience, my work experience comes as 7 years, 8 months. If I go for a skill assessment and later file EOI, I would get 10 points for work experience. How I will be to update work experience to 8+ after 4 months in the EOI portal, so that my points increase to 15 or points calculated while filing EOI are final? You can leave your current employment date blank while filing Australia EOI. Then, EOI will update itself automatically to give you extra points as and when your experience reaches next level. Hi Anil, I still can’t figure out how the calculation works. My ACS assessment considers employment after June 2014 as skilled experience. I filed for ACS assessment on 18th January 2019. When filing the EOI,which Start date I should mention? If you are not sure, then use 1st July 2014 as start date. Actually wanted to know that what documents they require for work Experience for ACS ? Check documents required for ACS assessment here. Please help me if you can. (you definitely can). I have Total of 10 Years 3 months experience as software engineer(web developer). from 01/November/2007 to 15/Mar/2019 in 5 different companies. I started my 3 year diploma in computer science(Govt. recognised) on 2005. (2004-2007). Because of pending papers, I got the certificate only on April 2011. What date will be my skill assessment Met Date? I cannot give detailed analysis with dates. You should do the calculation yourself based on above article. If you want detailed analysis, you should opt for private consultation and i can look into your education documents and suggest the dates. Please privide your email address for later communications. Yes, course completion date is important and usually ACS will NOT count the work experience that happens before your course completion. If you want to get paid private consultation, then contact us using this contact form. assuming one has no prior work experience and completes masters in IT in australia, following with a professional year, does that leads to positive skills assesment? ACS requires minimum 2 years of work experience to give positive assessment. but the information mentioned in the guideline is contradicting. 1)It mentions that either we should be working for a year or should complete a professional year program. 2)If you degree is assessed as AQF bachelors or higher with ICT major, you need 2 years of work experience. Not sure why are you asking question if you already know the answer. I answered earlier based on general ACS guideline as I do not know about your degree and its evaluation result. Hope you can help me, how many of experience year can I get based on ACS calculation (after deduction). I am applying for ANZSCO 263111: Computer Network and Systems Engineer. Unpaid leave: 01/03/2004 to 15/11/2006. Unpaid leave: 01/07/2008 to 16/12/2010. Add up all months excluding the gap periods. The, deduct 2 years from total and you should be able to reach the work experience years that ACS will calculate. Count the full weeks you have worked. ACS goes by the working weeks where you have completed full 40 hours working. Any gaps of work are simply not counted. I have calculated all the months after excluding the gap periods, they are almost equal to 147 months = 12 years and 3 months. Number of working hours per week are 45 hours. So if they will deduct 2 years from total, it will be 12 – 2 = 10 years that I claim, Am i correct? They will either deduct 2 years from the last 10 years or 4 years from the total depending on which one give you more ‘relevant’ experience. Hi Anil, I have around 14 year of experience and I have worked in 9 companies. I have all relevant document. But do not have in the format which you have mentioned. So is it necessary to get the experience in format specified for all the companies, more over in some office the leads with whom I have worked,are currently left working. Can I get the documents signed from them? Your question is out of scope of this article. I have added your question on our forum here and answered there too. You can ask your follow up question there itself. I am working as an Associate Project Manager for the last 5+ years. However, I have a bachelor’s degree in Electronics and Telecommunications. I have a positive EA assessment for engineering and I have submitted my EOI at 65 points for ‘Telecommunications engineer’. I did so because ACS assessment would deduct years from my experience. My IELTS score is 7.5. How good are my chances and what time frame should I be looking at? Your question is out of scope of this article. This article is for ACS assessment. I have created your question on our forum here and answered there too.